When the Arkansas Department of Parks & Tourism asked me if I’d be interested in taking on a dog-friendly adventure highlighting things to do in Arkansas, I jumped at the chance. When they told me Hot Springs was one of my options, I rejoiced! Hot Springs is America’s first resort and the birthplace of baseball spring training (Babe Ruth was once banned by his team owner from returning to Hot Springs). 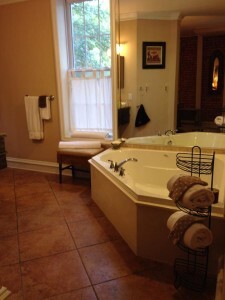 ‘Spa City’ is rich with history–the good kind. Drinking, gambling, baseball, mobsters, starlets…It’s also FALL Y’ALL and the perfect time to take a back road and be in no hurry. By ‘no hurry’, I mean you might get stuck behind a tractor, but once you pass them you’re back to 80. I mean, 50. I mean, 45. I mean, ya know, whatever the posted speed limit is. DO NOT SPEED through small town, rural Arkansas. There may only be one cop but he’s waiting for you to fly by with your out-of-state tags. Seriously, though. The more I travel the more I love a back road. It may take a little longer but it’s where you find the good stuff. Even if it’s nothing but the tall Pines of southwest Arkansas and the crimson Maples changing colors beneath them, it’s so worth it. Always, always take the back road. Look at me! I’m in a cone! Awesome. Way to go Henri. We’re about to set off on a sponsored trip and we’ve got to navigate the entire 2 1/2 days in a cone with a very NOT attractive wound. This will make lovely photos for our Christmas cards. Yay. My first worry was infection. Thank you Dr. Robb for talking me out of my tree on a Sunday afternoon, assuring me that drainage was ok, that a staple would be for cosmetic purposes only, and that we wouldn’t have to chop Henri’s leg off when we returned. My second concern was Henri being a driving distraction. He likes to jump from the front to the back seat, and sometimes into the passenger side floorboard. This problem was remedied by our new doggie seat belt, the Deluxe Car Safety Harness from Solvit. We’d had it for about a month but this was our first road trip with it. With Henri safely and comfortably secured in the backseat, I could roll down the windows and enjoy the drive. 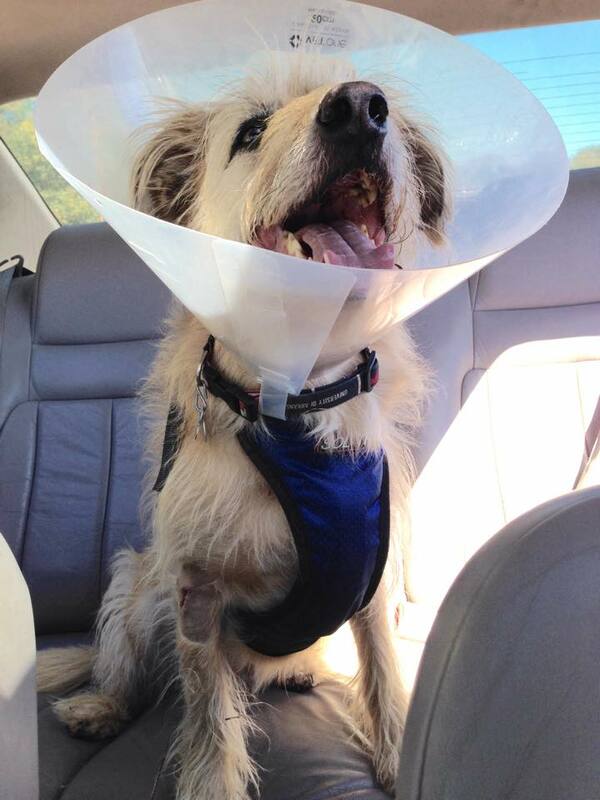 Please note that if you roll down the windows while your dog is in a cone, he might just lay down and stay there. The Deluxe Car Safety Harness from Solvit was a 3 hour sanity saver! I am often the ‘do as I say, not as I do’ dog trainer, and admittedly, Henri had never worn a seat belt. I was pretty convinced he’d hate it but more and more I was also convinced we really needed one. The Deluxe Car Safety Harness has a fully padded vest with a breathable mesh liner for both safety and comfort. It allows range of motion (Henri had enough freedom to move from one side of the car to the other, but not get up front), but locks in case of a sudden stop. It also has an attachment point for leash walking, which makes jumping out of the car for a potty break super-easy. The best thing about this product is that you don’t have to go to some specialty retailer to buy one. They have them at WalMart. I’ll never do another road trip without it. Because we liked it so much and we want you to be safe too, we’re giving one away. So be sure to ENTER TO WIN (after you finish reading this post). 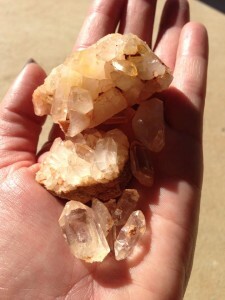 Our first stop was Wegner Quartz Crystal Mines in Mt. Ida, Arkansas. Mt. Ida is the quartz crystal capital of the world. The WORLD. And they’re dog-friendly. They are also only about an hour outside of Hot Springs and from where we were driving, on the way. I’d planned to arrive at Wegner 15 minutes early, as suggested on their website, to check-in for the 11:30 dig. I was late. There was a family (Mom, Dad, Grandma, Grandpa, small child) in my group and they’d already gone to the site. So once we signed in, waivers and such, Mr. Bill drove us the one mile to the digging site. We rode in the cab of his Chevy and got the scoop on the mines. The land is actually owned by the Bureau of Land Management and leased to Richard Wegner. Mr. Richard lives on the property, part of which he owns, part of which he leases and maintains. He’s been taking care of the area for 30 plus years now; they know exactly where to take visitors for a really great experience. There are several options available but we chose the two-hour dig at the Crystal Forest Mine. As much as I enjoy Kindergarten fun, I didn’t think digging in the dirt could hold my attention for four hours. I also had some concerns about whether or not there’d be shade for Henri. I was pleased to discover that there was plenty of that at this particular site. Henri parked himself on top of a shady red dirt mound and I plopped down next to him with my rented tools and bucket and started digging. Now, in all honesty, you don’t really have to dig much. If you’ve got a good eye, you can just walk around looking for anything that catches the sunlight and collect a decent handful of crystals in a variety of shapes and sizes. Mr. Bill prefers the large, clear, six-sided ones. He said that’s the way they are formed in nature. Some folks like the milky ones, but I was on a personal mission to find a big ol’ cluster. Unfortunately, after a little less than an hour of digging, the other folks at the site (the kid) were ready to leave. I guess there’s not much you can do with a tired, bored 6 year old. 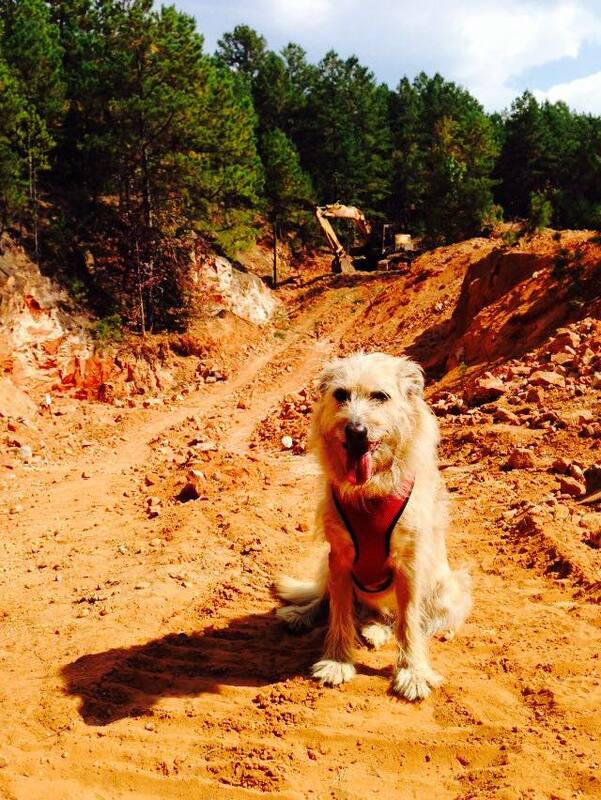 According to the safety rules, they can’t leave anyone alone at the dig site, so Henri and I had to leave too. First and foremost, take a human buddy- someone who can use a cell phone and/or administer first aide. If there had been another person there, they’d have let us stay. Second, take your own tools and bucket. You can rent them, but it’s $3.00 per tool/bucket. At the very least, take a bucket and some Ziploc bags. You’ll need the bucket for your finds, and the Ziplocs are handy for the small pieces. Mr. Bill had an extra baggie in his pocket that he gave to me. In addition to tools (I found a small flat-head screw driver to be about the handiest), you should take sunscreen, water, snacks if you want them, a spray bottle of water and a towel. The spray bottle and towel will help you clean crystals as you find them. That way you can determine on site whether or not you want to cart them home or throw them back and try again. Since we didn’t get our full two hours at the mine site, they did offer to let us go back with the 1:30 group, but we were due to check-in to our B & B around 3:00. The staff, Mr. Bill, Mr. Richard, and the four resident dogs (Happy, Smiley, Laurel and Hardy) are all very nice. If you tell them specifically what you’d like to find, they’ll point you in the right direction and even help you if they can. If you don’t find what you’re looking for on your dig, you can always buy something at the shop or one of the many roadside stands along the way, but I call that cheating. With a pocket full of crystals and Henri back in his cone and safety harness, we were off to Hot Springs and the 1890 Williams House Inn. Staying here is like staying at your rich Aunt’s country home. The 1890 Williams House Inn is located about five blocks from Central Avenue in downtown Hot Springs but seems a world away. The owner, Ms. Lynda, and her rescued Pekingese, Maizy, have been welcoming guests there for four years. With parakeets singing from their cage in the main parlor and three cats on the property, one of whom, Miss Kitzer, will walk right into an open door of the carriage house and plop herself onto your lap, staying here is like staying at your rich Aunt’s country home. From the moment I arrived, I felt as welcome as a close friend and enjoyed absolutely everything about this place. It just feels good. Our room was the Copper Cottage. It’s located in the carriage house and was once used as the bath stall. It features a small sitting area with a microwave and mini fridge, as well as a wheelchair accessible ramp to the bedroom and bath (also wheelchair accessible). 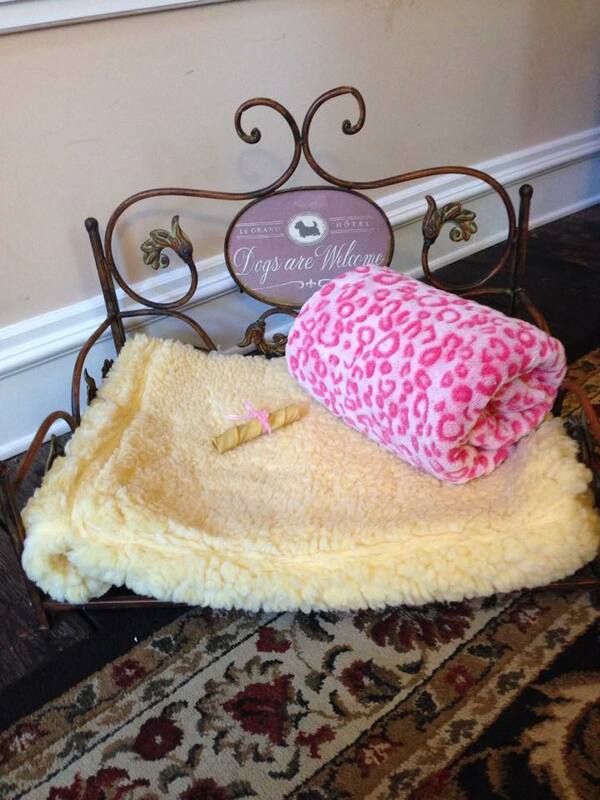 A small bed with an extra blanket and a pig ear roll-up tied with a pink bow were waiting on Henri. The main house does not allow dogs, except Maizy, but she doesn’t count. She lives on property and sticks so close to her mom that you’ll hardly notice her. Don’t be offended if she doesn’t come to you. Maizy is a puppy mill rescue and though she never showed any resentment toward me, it was clear I was suspect. The pet policy is ‘officially’ a 30 lb. limit but if your dog weighs more than that and is well behaved, it is likely that you’ll be welcomed. Just call. If you’re staying in the carriage house you’ll be given a door code to the main. You can come and go at anytime to help yourself to ice and/or sweet treats off the buffet. Coffee and juice are served every morning beginning at 7:45 and the wrap around porch is the perfect place to enjoy it. Breakfast is served at 8:30 or 9:00 a.m. on weekdays, your choice, and 8:30 or 9:30 on weekends. It was this time that I enjoyed most and I suggest you don’t miss it. Aside from the meal being delicious- fresh fruit, baked goodies, homemade quiches and casseroles- you can chat with other guests and get to know people. The dining tables are separated so you don’t have to visit if you don’t feel like it, but since I was alone and I’m kind of a talker, I really liked it. In fact, chatting with Ms. Lynda was my favorite part of this whole trip and you can probably expect her personal story to appear in a later blog post. By five o’clock Monday we were all checked-in, pottied, showered, changed, and brushed. It was time to locate a happy hour and a cocktail. I knew the historic downtown Arlington Hotel was dog friendly and it just so happened that they were also hosting the Hot Springs Documentary Film Festival. A quick phone call told me all I needed to know. Yes, the lobby bar was dog-friendly and “all the hours here are happy”, as in ‘no we don’t have drink specials’. It seemed like a good place to start anyway. The Williams is only five blocks from downtown and though Ms. Lynda walks Maizy around the neighborhood every morning, it’s not a walk I’d suggest taking at night. We drove to the Arlington but there wasn’t much excitement and the one TV behind the bar was so small that I couldn’t see the score of the baseball game (No! I don’t need glasses). After finishing my martini and grabbing a film schedule and program, we set off in search of food and a bigger TV. Sorry artsy film people. I have priorities. A short walk landed us at Fat Jack’s Oyster Bar and Grill. The patio was locked and no one was on it, but the TVs were on. I poked my head inside to get the bartenders attention. He immediately came around and opened the gate for us, bringing a menu with him and offering to bring Henri some water. It was perfect weather for enjoying baseball on the patio with my favorite boy. Since it was an ‘oyster bar’ I tried the baked oysters on the half, wrapped in bacon, topped with shrimp and covered in mozzarella cheese. I knew better than to go raw because I’d just compare it to the oysters on the Forgotten Coast, which are some of the best in the world, and that didn’t seem fair. Good call on my part because the Angels on Horseback were great and after a couple of innings, we made our way back to the car and back to our quiet little room off the strip. My first breakfast at Williams consisted of fresh fruit, sausage quiche, and…CARROT CAKE! It was like somebody called and told them I was coming. Why I didn’t take an extra piece, or the whole cake, back to my room for later is beyond me. The Tuesday plan was to head to Garvan Woodland Gardens, a 210 acre botanical garden lined by 4.5 miles of Lake Hamilton shoreline. The garden walk is approximately 2.5 miles, and there is an additional 1.7-mile loop around the Hixson Nature Preserve that features 45 acres of natural Ouachita woodlands. The trail begins in the Garden of the Pine Wind where the first thing I noticed was the soothing sound of a 12-foot waterfall, one of three cascades located in this Japanese garden. Ranked as the fifth best Japanese garden in North America, the Weyerhaeuser Bonsai Garden welcomes you with meticulously attended landscape, effortlessly blending Japanese cedars and maples with southern foliage. Next, we made our way to the koi pond marked by a giant metal koi sculpture and another waterfall. Here we stopped to make use of the fish food I’d purchased in the welcome center for $.25. 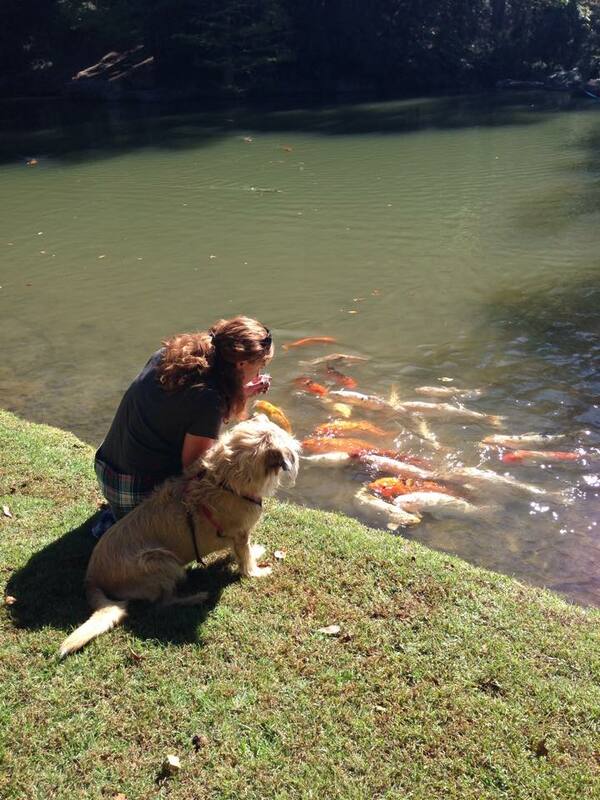 It was well worth twenty-five cents to watch Henri jump back from the swarming fish. We meandered around the Woodland Gardens loop discovering the Camellia Trail, Perry Wildflower Overlook, and the Three Sisters of Amity Daffodil Hill, which is home to over 300 varieties of daffodils. None of these spaces were in bloom in October but it makes an excellent case for a return trip in the spring. Other features we enjoyed were the scarecrow garden, sweeping rows of mums, and the Fern Glade. I have a love-hate relationship with ferns. Mostly, I love them and they hate me. My grandfather was a nurseryman for 25 years and I can grow just about anything but ferns. I become especially annoyed when I see them growing big, happy and unattended. Further evidence of my relationship with ferns was my inability to even capture a decent photo of them. Our last stop at Garvan was the Children’s Adventure Garden, the highlight of which is an enchanting fairy garden that replicates much of the architectural history of Hot Springs. There is also a man made cave with yet another waterfall and a maze comprised of more than 3,200 tons of native Arkansas boulders. Our meanderings took us about 2 hours but you could certainly take a lot more time. If you did both the garden and the nature preserve with a lunch stop at the Chipmunk Café in between, you could be there all day. Since we’d yet to explore downtown and my carrot cake had worn off, I decided we’d go in search of lunch elsewhere. Wear good walking or tennis shoes. You don’t need your hiking boots but Chucks were a really BAD idea. ‘Elsewhere’ took us back to Bathhouse Row on Central Avenue where I’d planned to eat at the supposedly dog-friendly patio at Superior Bathhouse Brewery. In January’s Take Flight in Arkansas I reported to you that this new brewery has a dog-friendly patio and were planning a biergarten for the summer. I’d never been there, but via email inquiry I was told, “We have some outside space that is pet friendly.” Imagine my disappointment when I discovered that not only do they not have a dog-friendly patio space, they don’t even have a patio. It was past 2:00 and I needed something to eat and a sit down. I hadn’t planned to eat at Rolando’s on this trip because we have one in Northwest Arkansas. The food is great but when I’m on the road I like to try new things. Unless of course I get hungry and angry (Hangry)- then, I don’t want any surprises; I just need to feed the beast. Since it was just down the street, we headed that direction. The Rolando’s patio is a little hard to find, but the good news is they have their own unmetered parking lot adjacent to it. Look for the white building with ‘Mountain Valley Water’ painted on the side of it. Turn onto that alley. The top level of the parking deck is theirs. 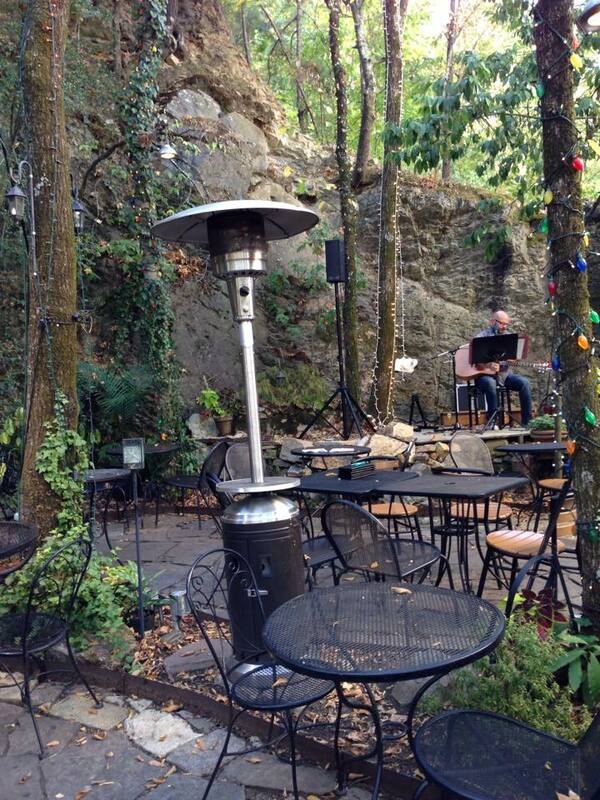 The patio is like a secret garden tucked into the rocky mountainside of a roof top bar. It’s cozy and shaded, and the withering summer landscape made a soft dirt bed for Henri’s nap. Our waitress, Serendipity, came to the table with a Styrofoam take out container of water. Without even looking at the menu, I ordered a Caipirinha, because I know they have them, and suddenly all was right with the world. You absolutely can’t go wrong with Rolando’s and I was remiss in my duties by not planning to take you there. There’s a reason this place was voted by the Arkansas Times Reader’s Poll as one of the best places to eat in Arkansas in 2015. Since they don’t allow dogs in the Bathhouses, this is the next best thing. The food, the drinks, and the outside atmosphere make it the perfect respite in an otherwise over-scheduled, busy, touristy day. A little food and drink goes a long way toward adjusting my attitude, and I think Henri really needed that nap. We were ready for more exploring. There are plenty of shops downtown that are dog-friendly including Pickles Pet Pourri and the Bathhouse Row Winery tasting room. You should also check out the eclectic mix of bohemian things at Earthbound Trading Company, clothes with fringe at Snazzies, and some really cute things for lake girls at Chez Julie. All of these places welcomed Henri; Pickles had treats. If shopping isn’t your thing and you’d like to get away from the traffic, head over to the Arlington Lawn. Across the street from the Arlington Hotel, this green space is perfect for taking off your not so smart shoes and wriggling your toes in the grass. You’ll also find the natural hot water cascade and pool, which shows what the area may have looked like before development. 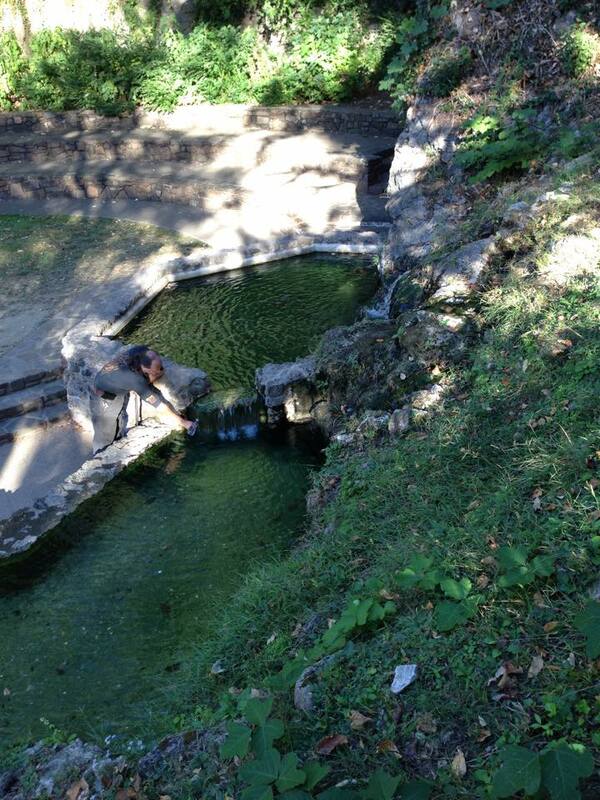 All of the 47 springs are covered with mesh to protect them from contamination, but water from the springs is available from public fountains and in any of the five bathhouses. I used some of the famed spring water to wash the Conehead’s wound. I’m not saying it’s the water, but it has healed nicely. To get even further away from the traffic, take a stroll along the Grand Promenade, which overlooks the tops of the bathhouses, or explore the many trails that make their way up the hill. Warning: You may notice pools of water pushing up from spaces in the concrete or spilling out from some of the fountains. Please remember that this water is HOT, flowing out of the ground at an average temperature of about 143 degrees. This is not good for little dog feet. Or kid feet. Or grown up people feet. By 5:30 we were feeling pretty exhausted, and since my parking meter had run out, it seemed like a good time to head back to our room. AH! Our room. Have I mentioned how much I love, love, love the Williams House Inn? Did I mention the carrot cake? Henri immediately crashed on the cool tile floor and since I could hear the TV from the Jacuzzi tub, I decided to spend the last 2 innings of the baseball game there. I turned on the water, adjusted the temperature, and dumped a bowl-full of bath salts into the tub. I grew up listening to baseball on the radio with my granddaddy, so I don’t really have to watch the game to enjoy it. With my head leaned back and my eyes closed, I used my toe to punch the jets on when the commercials started and punch them off when the game resumed. Thank goodness for that bath because without it, I’m not sure I’d have had the energy to go anywhere for dinner. Because I’d eaten lunch so late I wasn’t very hungry, but I didn’t want to miss the opportunity to check out Central Park Fusion. I’d heard lots of folks rave about it and many were surprised it was dog-friendly. Poor Henri. He was tired too. When I picked up his harness he looked so disappointed. Fusion is located very near the heart of downtown. It has a large, relatively unused patio and when we arrived, albeit 8 o’clock on a Tuesday night, there wasn’t a sole on it. The chairs were stacked and locked and it appeared to be closed. The restaurant was open so I poked my head inside to inquire. The waitress immediately came to unlock a chair and set-up for us, and offered to bring Henri a bowl. Fusion has bowls just for dogs. I ordered a glass of wine and having already looked at the menu online, knew I wanted to try the Duck Confit Eggrolls. It’s an appetizer but it seemed a good choice and the right amount of food. Beautifully presented and just as tasty, I promptly stuck my finger in each of the three sauces (Mae-ploy Thai chili glaze, Gluten-free soy, and sweet and sour) to get a quick flavor sample. Sorry there’s no photo, I forgot. Try mixing the Mae-ploy with the soy sauce before dipping. I discovered that although the restaurant is popular, the patio isn’t used much. The surrounding area is a little sketchy at night and during the day there is no shade since the Majestic Hotel across the street caught fire. You should still go there. In addition to a great food menu, they have over 140 different bourbons and whiskeys, some of which aren’t even on the menu. And yes, they have Pappy Van Winkle. The restaurant closes at 9:00 on the weekdays, which was fine. We’d crammed a lot into one day and I was ready for bed. French toast casserole topped with mixed fruit and bacon was my last meal at the inn. We said our good-byes and thank yous, loaded up the car and headed out around 11:00 with one last stop in mind. Ms. Lynda had suggested that we not miss the view from West Mountain. Since it was only about 5 minutes away and a little walking would be good for Henri before our three-hour drive, we decided to follow her advice. Once you turn onto West Mountain Drive, you’ll want to go left at the split. Not too far after that you’ll see the first place to stop. From here you can see much of downtown Hot Springs, including the Mountain Tower in the distance and some of the bathhouses. When you get your fill of that view, head on up to the top. 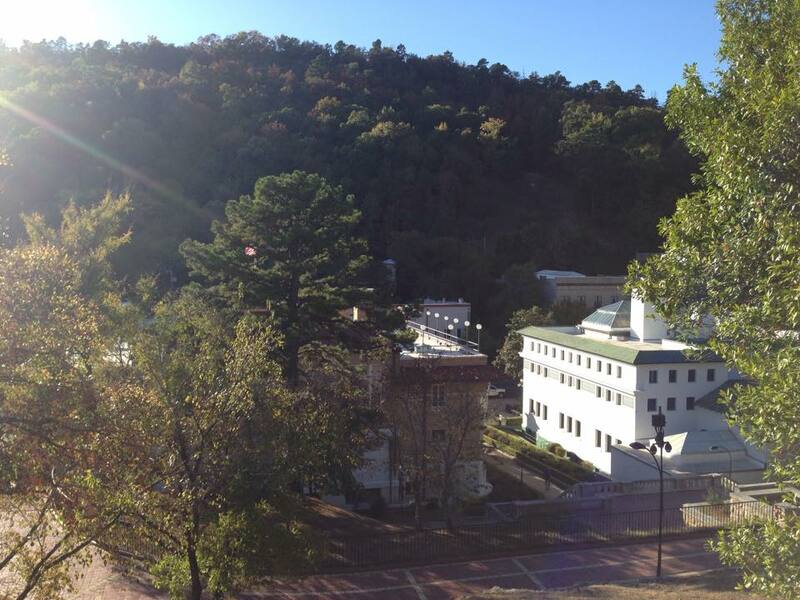 Here, you can enjoy a more expansive view of Hot Springs and the Ouachita Mountains. There are also many trails leading off, down and around the mountain that you can explore. Be careful, however, because it’s easy to get lost and end up walking further than you wanted. We had been warned of this risk and only walked about a ¼ mile before simply turning around and going back the way we came. If you have the time, West Mountain Trail would make a great afternoon hike consuming as many hours as you had available. And that’s the really great thing about Hot Springs from a ‘traveling with your dog’ perspective. Unlike a lot of places, you don’t have to drive far to get to a beautiful mountain trail or enjoy nature. From just about anywhere in downtown you’re just minutes away from the solitude of acres of woodland. A few short minutes back and you can have a glass of fine wine in your hand and a tired dog at your feet. For more information on dog-friendly things to do in Arkansas search our blog or review the sample itineraries at the Arkansas Department of Parks & Tourism. What a fun trip! I’m sorry Henri had a rough start, but hopefully he’s doing much better now! Henri is doing great and we are plotting our next adventure. Thank you! A dog friendly experience like this? Count me in! Thanks for the comment! I hope you’ll check out more of our blog for other adventures.